Baseball is divided into three divisions: ""Double A" Minors, "Triple A" Minors, and Majors. Eligibility for each division is described more fully below. 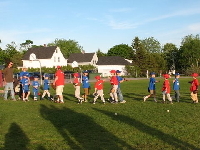 • All Games are held at True Park, in Hope – Mondays and Wednesdays evenings, and Saturdays at 10:00 a.m. and/or 1:00 p.m.
• Each player receives hat to keep, and will be given a uniform jersey, belt, and socks to be used for the season. This developmental league is a perfect for players ready for competitive play but who could benefit from focused instruction. Players will learn the fundamentals of each position and be given opportunities to play at every position. • Tuesday and Thursdays evenings., and Saturdays at 10:00 a.m. and 1:00 p.m. Tues. and Thurs. games are 4 innings. Saturday games are 6 innings. • PRE-SEASON CLINICS: SUNDAYS March 10, 17 & 24. At Camden Hills Regional High School gym. From 4:00 to 6:00 p.m..
• TRYOUTS: Saturday, March 30, at Camden-Rockport Middle School gym. 9-12 year olds: Check in at 8:30 a.m. Please wear sneakers and bring baseball glove to tryouts. "Minor League Baseball programs for boys and girls may be operated within each division for younger players with less experience. The minor league may be players ages 5-11. 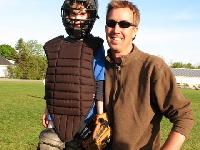 ... By local option, a player who is league-age 5 ... for the current season and has played a year in Tee Ball may be 'moved up' to a coach-pitch division." 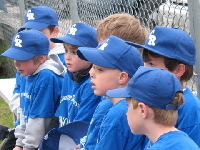 The Five Town Little League Board of Directors encourages children LL-aged 5 and 6 to first experience one year of Tee Ball before trying the Minors Baseball experience. Requests for Tee Ball dispensation for six year-olds should be directed to the FTLL President, who will consult with the Board of Directors. All decisions on such requests are the sole province of the Board of Directors and are final.